Al Williamson, the youngest of the major EC Comics artists and a longtime veteran of the comic book and comic strip fields, a well-loved industry figure best known for his classic approach to comics illustration, died on June 12. He was 79 years old. A message from the family released after his passing indicated that Williamson had suffered from Alzheimer's over the last few years of his life. Williamson was born in New York City. He spent a significant portion of his childhood in Colombia -- his father's homeland -- before moving back to the United States for his teen years. He and his mother settled briefly in San Francisco before making their way back to New York City. By this time Williamson had already taken an interest in adventure comic strips, including features he would have only seen in Colombia and an anecdotally famous viewing of a Flash Gordon serial. It was no surprise that he eventually settled onto Alex Raymond and his titanically successful Flash Gordon as aspirational favorites. Williamson was among the early students of Burne Hogarth's Cartoonists and Illustrators School, having been one of the irascible Tarzan cartoonist's students in a more informal setting that preceded the school's establishment. While at Cartoonists and Illustrators, Williamson met several working or soon-to-be working cartoonists, including Wally Wood. Williamson would later cite his friendship with Roy Krenkel during this period as a key factor in his career, as Krenkel was systematically interested in the same kind of art as Williamson and was therefore able to introduce him to several illustrators with whom Williamson had only a dabbler's familiarity. For the obviously talented like Williamson, the line in comics' exuberant mid-1940s between art student and working cartoonist was gossamer thin. Williamson's first professional work in comics may have been for Famous Funnies, a well-known and generally kind recipient of many artists' early comics and spot illustration submissions. Williamson's first comics narrative artwork may have come in New Heroic Comics #51 (Eastern Color, November 1948), Wonder Comics #20 (Standard, October 1948), or even assisting his teacher, Hogarth, as much as he demurred from making that a more formal partnership. Williamson also gained another group of acquaintances, the Fiction House cartoonists that included Mort Meskin, and met his artistic inspiration and longtime idol Raymond. The first burst of professional productivity in Williamson's career came in the still relatively industry flush period of 1949 to 1951. During these years Williamson worked for a variety of clients, including AGC, Avon and Eastern Color. He worked with at least two future hall of famers, Frank Frazetta and Wally Wood, as occasional inkers and had not yet settle on a genre. His assignments were of the seven to nine-page variety, with a potential except a 12-pager for John Wayne Comics called "The Weeping Walloper" many believe to be from the Williamson/Frazetta duo. It is through his various contacts already at the company and, one imagines, the obvious skill displayed in stories like "Where Worlds Collide" for Fawcett, that Williamson ended up in the EC stable of freelancers as that company was in the midst of its 1950s heyday as the industry's primary publisher for consistently excellent genre comics. 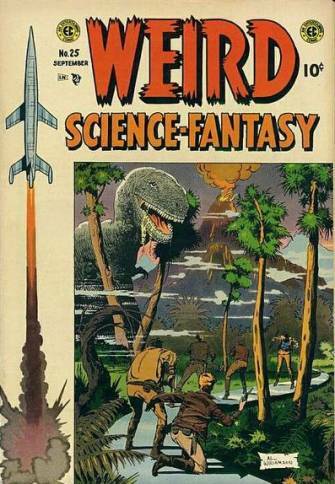 Most of Williamson's work came on the science-fiction comics working from writer/editor Al Feldstein's scripts. He employed a variety of inkers, including Frazetta and Krenkel, but also Angelo Torres, all of whose friendship had coalesced into a group called the "Fleagle Gang" after the troop of robbers. Williamson also worked in two other areas of EC's interest: crime and horror books. 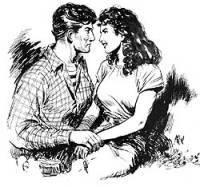 Among his best remembered stories were "50 Girls 50" (1953), "I, Rocket." (1953) and "The Arena" (1955), crisp science fiction with dramatic underpinnings that depended on Williamson's ability to draw compelling figures. His last story for the publisher, which in its multiple-publication form would not survive the decade but which in memory has only grown in stature, came in early 1956. It may have been Williamson's relative youth that kept him in comics when its industries began to turn in on themselves, in the process scattering many of his EC peers to the four winds of commercial illustration and other places that might provide more lucrative work. Williamson became for a brief time a rock at a still mostly productive Timely/Atlas, peppering the line with a wave of short stories. At the company that would eventually settle on the name "Marvel," Williamson extended his circle of occasional creative partners to include George Woodbridge and Ralph Mayo, and his genre mastery to war and westerns. Williamson's early- to mid-1950s western work in particular constitutes some of the better mainstream comics offerings in a mostly forgotten genre practically stuffed with great illustrators. Williamson's late '50s work was fundamentally sound and grounded in solid figure drawing, although the speed with which he now had to work meant a lot of dropped backgrounds and a kind of design that called to mind specific individuals rather than outright rendered them on the page. In the late 1950s, Williamson worked for a variety of publishers in the manner of most artists' first few years in the field, stringing together a client list that included Classics Illustrated, AGC, Prize, Dell and Charlton. A stint at Harvey Comics in 1958 and 1959 provided Williamson with his first sustained chance to try inking someone else's work, over stockpiled pages of Jack Kirby's pencils that eventually appeared in Race To The Moon and Alarming Tales. 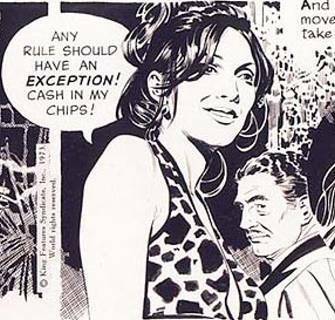 In 1960, Williamson was offered a chance to move to Mexico and assist John Prentice on the newspaper strip Rip Kirby, created and originally illustrated by Williamson favorite Alex Raymond. It was during this time he received a second education on comics craft from Prentice, training that would serve him well in the years ahead. Williamson also assisted on Big Ben Bolt for future Prince Valiant artist John Cullen Murphy, and on Don Sherwood's military strip Dan Flagg. As an artist and a recruiter of his former EC peers, Williamson was one of the rocks of the early Warren Publishing black and white comics magazines, working closely with longtime dear friend, the writer and editor Archie Goodwin. 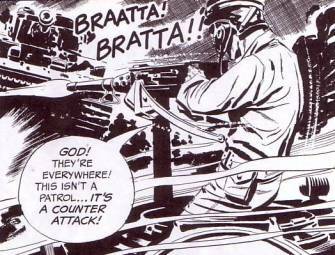 His work appeared in Creepy, Eerie and Goodwin's Blazing Combat (with Angelo Torres). Later that decade, Williamson began the first of his two great runs in the Alex Raymond adventure tradition with art on a Flash Gordon comic book series for the short-lived King line. Williamson's work was so popular he was invited back after a planned one-and-done series debut to provide more work on the series. It was also the platform for his first mini-run of comics awards. 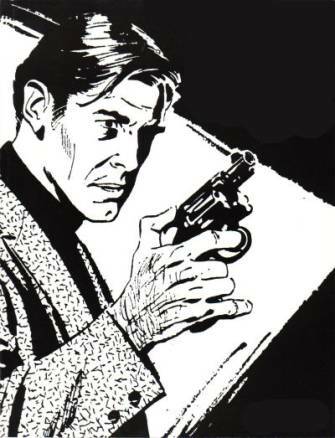 In 1967, Williamson took over the Raymond-created Secret Agent X-9 newspaper strip, this time in collaboration with Archie Goodwin. The strip changed its name to Secret Agent Corrigan upon the new creative team's arrival. It is among Williamson's strongest work in any medium or format; the consistent quality of the inking is astonishing for a daily strip, and the feature was one of the best-drawn of the 1965-1980 time period. Williamson apparently used himself as the model for the strip's lead, which various anecdotes claim caused some consternation to those meeting him for the first time. At this stage in his career, Williamson seemed to have become one of those unifying cartoonists: an artist who had work in so many places and counted so many other comics people among his friends that it's difficult not to look back on comics history of the time period and see Williamson's work staring back at you. For instance, despite being a working comic book and strip cartoonist in publications about as mainstream as they come, Williamson placed two stories in the underground/overground publications witzend #1 and in Flo Steinberg's Big Apple Comix. These were solid stories, but his presence also helped cement the underground comix as a legacy-bearer for the defunct EC Comics so many of those cartoonists remembered fondly. Williamson played a similar role in bridging the gap between fan efforts in appreciation of the form and the professional industry as it began to change in light of those efforts and a new wave of people that wished to enter the field. Williamson was a contributor to and the subject of fan histories and appreciations. He began to attend comic book conventions and provide the emerging generation of comics craftsmen the same kind of encouragement he received in post-World War II New York. You could even find his contributions sprinkled among the better fanzines of that fertile time period for fan publications. 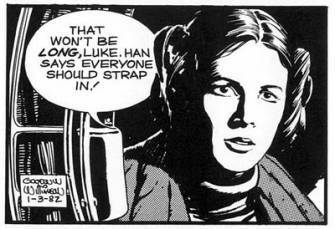 The list of working pros with some sort of Al Williamson story spotlighting the generosity of his time is nearly as long as his professional credits. Williamson stopped work on Corrigan in 1980. As that decade pushed forward, Raymond lent more of time to Marvel's iteration of the Star Wars universe, including the direct movie adaptations (he did the over-sized Empire Strikes Back), the series that danced around the films (he did several issues of the comic book) and the strip that grew out of both (until its 1983 cancellation). 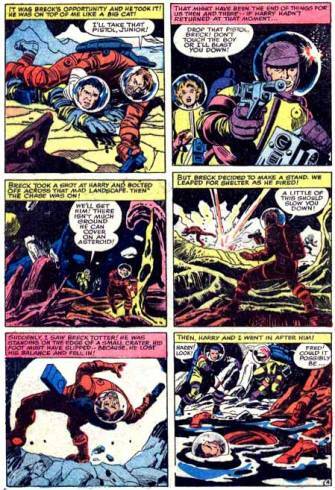 Williamson facilitated the original trilogy's on-the-sleeve affection for old-time sci-fi serials with the look and grandeur that such efforts once had on the comics page. Williamson as much as any artist working any aspect of George Lucas' creation dressed the sterile reaches of space with a bustling sense of life and attendant drama. He drew handsome men and beautiful women who grew to whatever task placed in front of them. At times, it was almost as if Williamson provided the work a straight-line pedigree that more cynical audiences would have traced to a dozen pieces of source material were it not for the verve and attractiveness of the cartoonist's atmospheric art work. The 1980s were another fertile period for a range of Williamson work (although even in the 1970s he somehow managed to do comic books for publishers like Gold Key and Warren while maintaining a strip cartoonist's rigorous schedule). His work reached a number of casual fans through another adaptation of a Star Wars (Return of the Jedi) and the Harrison Ford vehicle Blade Runner. 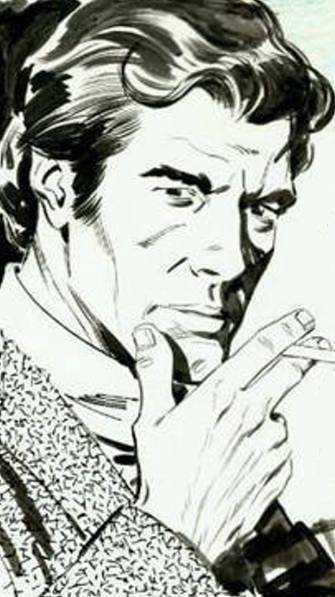 He participated in the post-Direct Market diversification of the comics market with a back-up feature in the notable Pacific Comics thriller Somerset Holmes. 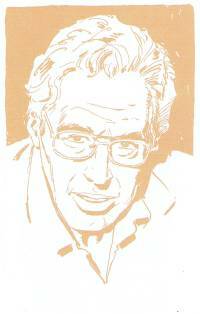 He was one of several pros that contributed short stories to the memorable and market-prescient Superman #400, while two stories he did for the then-fading Marvel magazine Epic seemed to exist just to show all the younger cartoonists how a pro got it done, particularly "Out Of Phase," in issue #34. Both of those were done, naturally, with Archie Goodwin. 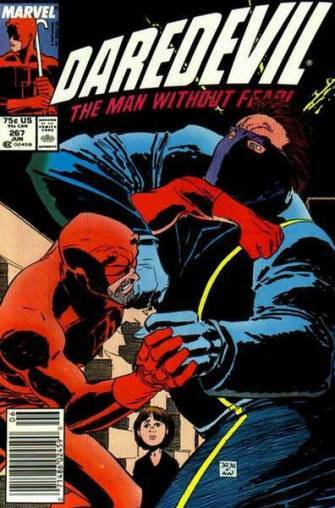 For the last 25 years, Williamson was probably best known to comics fans for his inking assignments. He began actively seeking that work in the mid-1980s, partly as a capitulation to a market structure that would not allow for a long lead time on individual projects of the kind he wanted to do with the same reward it gave to periodical work. Never has an industry benefited more by fundamentally failing a great artist. Williamson would lend a supple line to a variety of artists including but not limited to Pat Olliffe, Curt Swan, John Romita Jr., Mike Mignola, John Buscema and Gene Colan, not coincidentally on some of those artists' best works. This was the second period where the industry showered awards on the cartoonist in recognition to this work. Williamson spent the balance of his remaining career between these sparkling runs on other people's pencils on series and one-offs like two of the three Star Wars prequel adaptations and occasional all-in-one projects that took one's breath away for the still-evident mastery and skill Williamson could show given fuller reins on a project. He drew Flash Gordon in a two-part mini-series written by Mark Schultz that at one of the most crass periods in mainstream comics history, the middle 1990s, came across like a sparkling gem of old-school values, of a quality with his 1960s work on the character or the underrated movie adaptation from the very early 1980s. Williamson would also work with Schultz on a late-'90s Dark Horse Presents short called "One Last Job," which wasn't literally true but seemed close enough for some fans to take notice. A 1999 story featuring the Sub-Mariner -- a character whose publishing history raged back and forth in terms of the quality of the artists delineating his adventures -- would be published almost 10 years later and was a highlight of Marvel's year. Williamson won an NCS division award for Best Comic Book (1966), two Alleys (1966 and 1969) for Best Penciller, a Nova Award (1969) for illustrative art, two inking award Eisners (1991, 1997) for work at Marvel and seven inking awards from the Harveys (1988-1991, 1993-1995) for Marvel projects. He was voted into the Eisner Hall of Fame in his third year of being nominated, 2000, as a selection of the Eisner voters (as opposed to the judges). 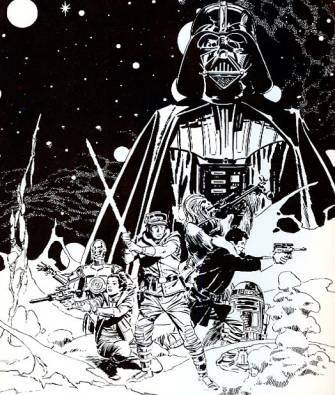 There are at least a half-dozen books about the artist and his long career, while new Star Wars comics steward Dark Horse not only reprinted much of Williamson's work with that property but published a volume of his early comic book work as Al Williamson: Hidden Lands in 1984. Williamson is survived by a wife of thirty-two years, Cori, by a daughter Valerie and by a son Victor. In lieu of flower the family requests that donations in the cartoonist's memory be made to either The Joe Kubert School, 37 Myrtle Avenue, Dover, NJ 07801, Attn: Al Williamson Scholarship Fund; or Yesteryears Day Program, 2801 Wayne Street, Endwell, NY 13760.